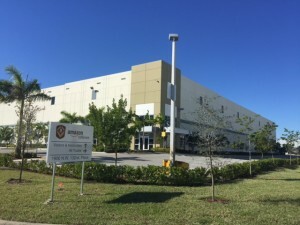 In the Summer of 2014, Amazon.com leased their Miami warehouse located at 1900 NW 132nd Place aka the Miami International Distribution Center located within the Pan American West Business Park in Miami. The free-standing, class A building measures 335,841 sq. ft. At the time of this posting, the warehouse still appears to be undergoing some work and there are no employees there other than a security guard or two. The Amazon warehouse in Miami was one of the largest lease transactions in 2014. Online retail distribution and e-commerce continues to be a popular trend in the South Florida warehouse market. It is also good to see a new company enter our market. For more information on this transaction and other warehouses in Miami, please contact the ComReal Miami Warehouse Team at 786-433-2380.